This is the best package for all ye sporty ladies where we combine music dance exercise and drinking games ..! It promises to be fun with a competitive edge which lasts 1 hr 30 minutes which involves doing Low intensity exercises, such as squats push ups, the plank and more .! 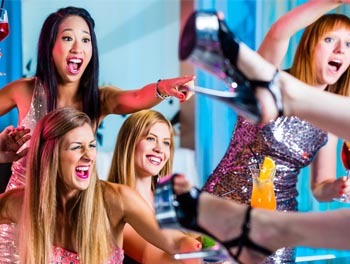 Looking for an Exciting, Thrilling, Fun Hen Party Package that involves many tasks and team interaction activities, then you must consider our Hen Party Bootcamp package. The Hen Party Bootcamp includes activities such as Gin & Yoga, Cha Cha Slide Dance Off, Egg and Spoon Race, Hula Hoop games, Giant Jenga and many more activities and challenges you and your fellow hens must complete. First our Military instructors will put you and your hens through some light physical training which includes: Low intensity exercises, such as squats pushups, the plank and more with some Gin and Yoga thrown in for good measure to get the juices flowing. Training will be followed by a list of activities, tasks and challenges to test your stamina and intelligence. Your party will be split into two teams and will go head to head in a list of tasks to find the bootcamp competition winner. Our Hen Party Booth camp will put you and your hens to test and will judge you on your stamina, fitness, intelligence and alcohol intolerance. Pass the bootcamp challenge and you and your hens will receive your bootcamp certification that you can treasure forever. This package is not for the faint hearted, it’s designed for all those hens who love to laugh. We highly recommend this package!